Conceived as an air transport for American ICBMs, the C-133 Cargomaster was developed by the Douglas Aircraft Company and first flown on 23 April 1956. It was the second and largest turboprop transport to be accepted by the U.S. Air Force. The C-133 was designed to meet the requirements for the USAF's Logistic Carrier Support System SS402L. The aircraft differed considerably from the C-74 and C-124 Globemasters that had preceded it. A high-mounted wing, external blister fairings on each side for the landing gear, and rear-loading and side-loading doors ensured that access to, and the volume of, the large cargo compartment were not compromised by these structures. The cargo compartment (90 feet in length and 12 feet high) was pressurized, heated, and ventilated. The Cargomaster had a 13,000 cubic foot cargo area with floor tie-down facilities permitting installation of 200 airline-type seats. The C-133 could accommodate 110,000 pounds of cargo or a fully-assembled Thor, Jupiter or Atlas ballistic missile. Cargo was loaded via a two-section rear door assembly, the lower section formed a ramp for drive-on/drive-off capability, or by a cargo door on the port side of the forward fuselage. The C-133 was able to accept practically every type of vehicle in service with the U.S. Army. The Cargomasters went directly into production as C-133A; no prototypes were built. The first C-133As were delivered to the Military Air Transport Service (MATS) in August 1957. A total of 35 were built: the last three having a "clamshell" rear door assembly which increased the compartment length by 3 feet, making it possible to airlift completely assembled Titan missiles. These were followed by 15 C-133B aircraft that retained the "clamshell" doors and incorporated more powerful engines. 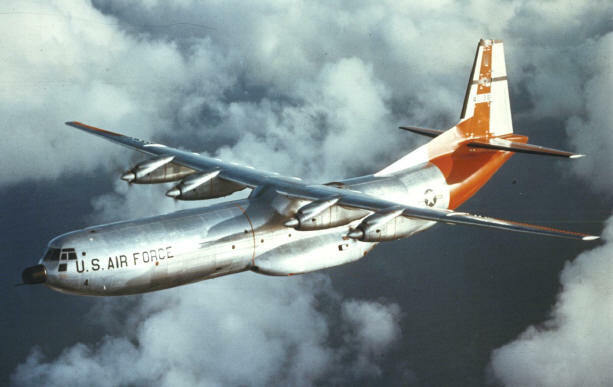 In 1958, C-133s began flying MATS air routes throughout the world, and two C-133s established transatlantic speed records for transport aircraft on their first flights to Europe. The fleet of 50 aircraft proved itself invaluable during the VietNam War, but fatigue problems led to their withdrawal from service in 1971. Sorry. No models are available for this aircraft.